This week playwright and poet David Freeman died. He was a writer of power and passion whose work opened our eyes to the world in a new way. Freeman's groundbreaking and highly theatrical play Creeps was the first play produced at the fledgling Tarragon Theatre in 1971. Creeps paints a frank and courageous portrait of a group of disabled people struggling to find meaning in a society that places little value on their lives. Since Freeman was born with cerebral palsy, he knew his subject. He also was fortunate to have placed his play in the hands of a great director (Bill Glassco) and a stellar cast that included a young John Candy. But it was the power of the writing that made Creeps such an important event in Canadian theatre history. David French used to tell the story of how he met Bill Glassco and began his long association with Bill and the Tarragon. It's a long story, but it starts with Creeps. David's sister-in-law, Marlene Aarons, had seen the play, and told David that he should go. David was reluctant, but Marlene insisted. David was so impressed with the show that he immediately knew that he wanted whoever had programmed and directed Creeps to direct his own work. He went to the box office and asked for the director's phone number. Which was given to him on the spot! David phoned Bill Glassco and made an appointment to see him. I found a photo of the two Davids along with Michel Tremblay in the closet a few months ago, and after David Freeman died, I posted it on Facebook. It was picked up by CBC and several other news outlets, but I will repost it below. I'd also like to share a beautiful poem that David Freeman sent to me after my David died in 2010. It serves as a tribute to them both. 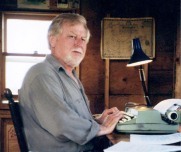 FOR DAVID FRENCH (1939-2010) The day seized In staccato rhythm Of typewriter keys As enraptured youth Captured truth. We could do no wrong On Tarragon Stage Where actors voiced Our rage. The world was our oyster: We were the pearls. The headiness made our heads Swirl. The center of attention, Hardly a day went by When our names Weren’t mentioned. Fame flees rapidly And doesn’t defy Gravity. What goes up Must come down Including Toasts of the town. The spotlight that warms Also burns. In theater, fortunes Turn On a dime. Time Goes fast. Fashions pass. But Works of passion Leave lasting Impressions. Dispersed Seeds to change The universe, However small, Are better than No seeds at all . We were young Turks Back then And now That you’re gone, Your words, your work Will live on. 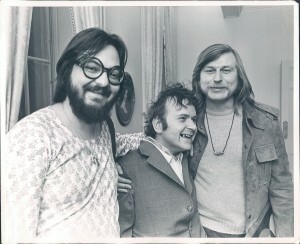 Michel Tremblay, David Freeman, and David French at the Chalmers Awards, 1970s.